To plant Conophytums is a very straightforward process, and there is no complication when sowing. The best moment to plant is in Autumn, the transition of climate between summer and winter is the best environment where the seeds can grow because of the humidity of autumn release the growth of new roots. The induced artificial climate is also a good option if you do not want to wait. The right soil for Conophytums is a well-drained and porous substrate, specifically a free-draining loam-based soil mix. If you do not have this mix, the other option is to use a substrate for succulent plants with a considerable layer of gross sand. This type of soil is the best match for these kinds of plants, due to the delicate roots it has, hence the need of a loam-based soil with good drainage that will allow Conophytums spread their roots easily. Generally, the best containers for Conophytums are plastic pots (avoid clay pots because they dry very fast). Conophytums have shallow roots, so, the pots alike pans are a great option, they do not pass the 10 cm (3,93 inches) long, in other words, they’re perfect. If you do not wish to plant directly in pots, despite that the possibility of growth is high, another option is to plant in a seed tray. Be aware that once you sow in a seed tray, you must transplant in late autumn (the growing phase starts). Keep in mind that when doing the transplanting you should change the old substrate for a new one. Independently of your choice regarding where you are going to plant the seeds the next step is to press the seeds down (do it gently without the need to sink the seeds), some people prefer to use a piece of flat wood or paper to perform the light pressure, then lightly water the seeds. The pot should be moist all the time and must remain closed during the process of germination (one or two weeks), you can cover the container with glass, plastic, or another thing that helps the seeds to keep warm and moist during this phase. The adequate temperature for germination should be not too high, in the day the temperature should be between 15º C (59º F) and 20º C (68º F); when the night falls the temperature should be from 5º C (41º F) to 10º C (50º F). When the process of germination ends the seeds tray should not remain closed, in this way, the plants get accustomed to the air. These plants do not require compost; however, it won’t hurt them if you add the fertilizer when they are growing and after flowering. Remember this is an optional step. During the growth process of the plants, you will be able to observe how some plants are weak and others are not, in this case, to remove the weak plants to give way only to the strongest and robust ones. Light: The most attractive of the Conophytum is in the variety of colors they present. 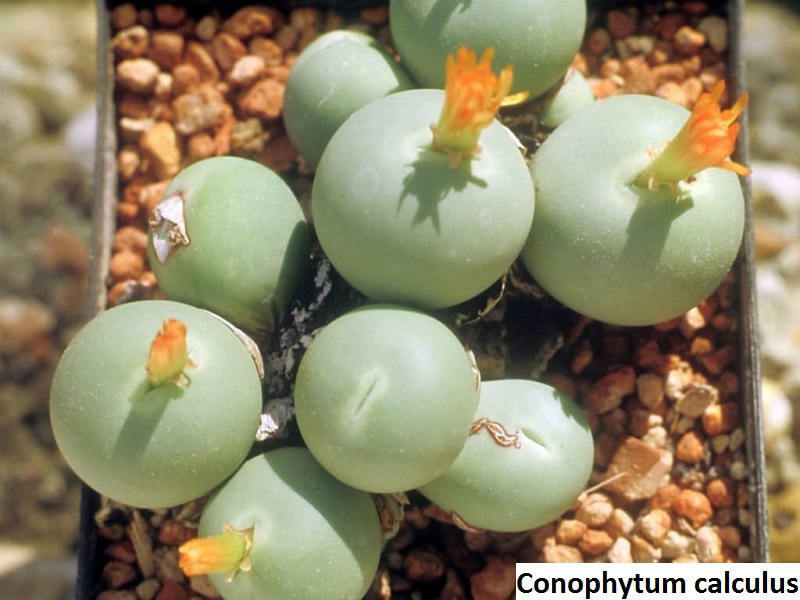 To maintain these colors, the Conophytum must have light during its growth process. The light needed will depend on the season of the year, for example, if you are in winter, you must place the Conophytum in the lightest place of your house (plants may get green and soft during this season, do not worry). When winter ends, and the first rays of sun begin to appear daily, exposure to the sun should be moderate to avoid burning. When summer arrives, the temperature tends to be very high so, it is necessary that the plants are in a place with a lot of shade. Watering: during autumn and winter the frequency of watering should be moderate to every three or four weeks. When February arrives, you must increase the watering because, at this moment, the new leaves start to form. In April, the plants start the resting time, and the decision of watering is up to you. There are many opinions out there, people claiming to not water the plants during this time, though, other people claim to water the plants and have successful results. Finally, to the people who decide to not water, it is resumed finishing July, once a week. By the way, the best indicator to know when to Conophytum needs water is when they have on their skin some wrinkles. Pests and illnesses: the Conophytum are plants that rarely contract illnesses nor are delicate plants prone to pests, though, some things that may happen are; rotten roots due to excess of water, to solve this problem stop the excessive watering and remove the plant with rotten roots. The other thing that may happen is white spots on the underside of the leaves these are cochineals, an insect that commonly resides in this type of plants; To get rid of this insect you can clean the plants with a cotton pad or with an anti-cochineal insecticide. Temperature: these plants can support cooler climates but if the temperature goes below 0º C (32º F) the soil must be free from moisture. The temperature for warmer climates should not exceed 40º C (104º F) in summer, in this situation a good entry of air plays an important role. Cutting: some people love a pot full of plants, others can’t stand old plants, and other want to plant more. Whatever your case, after some time cutting is necessary. The best moment to cut the growth is when the leaves are not so young neither so old. To do this process does not require eminent skills, all you have to do is to remove the leaves of the edges and replant it in the space of your preference.